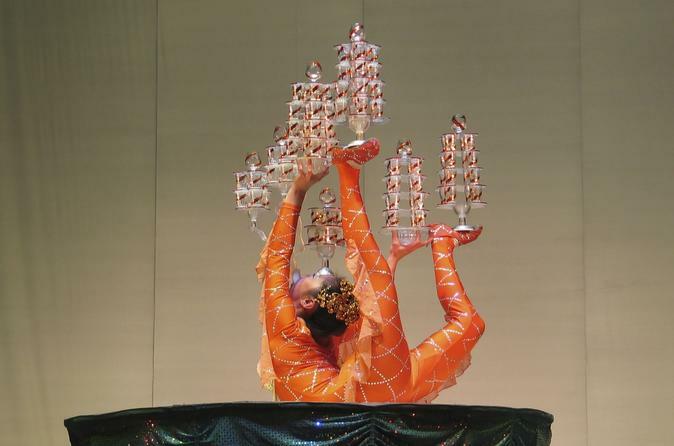 Immerse yourself in the captivating choreography and dazzling color of a performance by the Shanghai Acrobatics School and Troupe on this 4-hour tour. Marvel at the graceful agility and immense skill of the performers as they demonstrate how they have won hundreds of international competitions. After the show, see some of Shanghai’s most alluring landmarks by night as you embark on an evening tour with a knowledgeable guide. Enjoy the convenience of round-trip transportation from your Shanghai hotel on this tour. 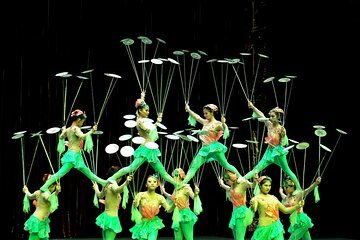 Commence your cultural tour with hotel pickup in an air-conditioned vehicle and venture to the venue hosting the Shanghai Acrobatics School and Troupe. Take your seat in a well-positioned seat and hear an expectant hush descend over the audience as the acrobats burst into their captivating performance. Marvel at the world-class skill of the acrobatics and they perform a routine of compelling choreography practiced over centuries. Applaud raucously as the shows comes to its dramatic conclusion and then commence your evening tour of the city with your knowledgeable guide. Stroll the illuminated streets to significant landmarks like People’s Square and the French Concession District, and admire the glittering lights of The Bund as they reflect off the calm surface of the waterfront. Conclude your walking tour at Xin Tian Di, a chic and cosmopolitan area thronged with boutiques, bars and restaurants. Choose to bid your guide farewell here or travel back to your hotel with the group. The acrobatics show was decent but our guide seemed to be in a hurry to be rid of us after the show. Apparently everywhere in Shanghai was too busy so we just got taken straight back to our hotel after the show. We could've just bought tickets to the show and caught a taxi there and back and saved ourselves a lot of money. Alena was also my guide on this tour. Again, very friendly and knowledgeable. While the acrobatics show was really good, this is where the good stuff ends. The guide had nothing at all to say about our Bund Drive...and we actually saw nothing at all of,the Bund...we swiftly drove past the area...but we were in a family type van with windows that were below our eye level...so to see anything at all we had to duck low....but we still could not see much, and nothing taller than a tree..we didn't see any buildings at all accross the river.the windows were simply too low. If you didnt have a window seat you couldnt see anything at all. We didnt even get out of the vsn to see the Bund! Luckily, we had a second tour with another company the following night, so we did see the bund, but otherwise, i would recommend a taxi drive past the area would give a mich better view. We were also told by our other guide that this particular acrobatics show, while good, is not the great one...i recommend taking a taxi to the other show and then ask to drive to the Bund...take a river cruise here and really see the magnificence of the amazing light show on the skyscrapers of the Bund. We had trouble getting to our hotel in time to meet the tour group, and thankfully, since I had left my phone number with Viator, the booking manager was able to contact me to find out my location. We were having trouble catching a cab on our own that would be willing to drive us to our hotel, so the booking manager spoke with the cab driver and explained to him where he needed to take us so we could join the group. The Chinese Acrobat show was good. But I was expecting more for what I paid. The guide could have done a better job communicating with the group. He took us out of the van to walk down the length of a mall, but most of the tourists in the group didn't know why we got out since he didn't really explain that much about where we were. Unmissable if you are in Shanghai, truly spectacular and good fun. This show is UNBELIEVABLE and should not be missed when you're in Shanghai! The tricks the acrobats do are amazing throughout the entire show. One of the highlights of our cruise trip to Asia! We loved the acrobat show! It is difficult to describe many of the incredible stunts that were done during the performance--my son and I repeatedly wondered how they thought of it in the first place and couldn't imagine how they ever figured out how to do it! Well worth the money.